. 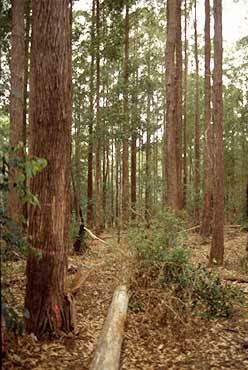 : Farm Forest Line - Native forest silvicultural options :. 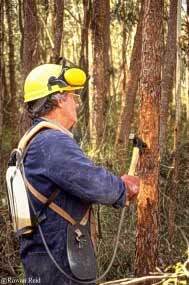 Most discussions about silviculture methods in native forests concentrate on harvesting options. Broadly speaking there is a range of options from individual tree selection through to total clearcutting. Harvesting option choices will be influenced by practical and economic considerations. But the environmental effects of each option are most important for achieving successful regeneration, and minimising the effect on other environmental, social and economic values. In Ross Florences book Ecology and Silviculture of Eucalypt Forests, the effect of native forest harvesting on regeneration is shown in a graph from Smith (1962). The graph shows the relationship between the percentage of the tree canopy removed and the environmental factors that are likely to influence regeneration. Depending on the species mix that the landowner wishes to, or must, regenerate, it is possible to define an appropriate harvesting intensity that ensures sufficient seed for regeneration and provides an environment that supports vigorous growth.  contribute to economic production from grazing or harvesting non-timber products such as flowers or bush foods. Thinning can be done using a chainsaw, brush cutter or by stem injection of herbicide. Developing an understanding of a forests ecology and dynamics of the forest is important for developing effective management options. It can also greatly enhance the owners appreciation and enjoyment of their forest.